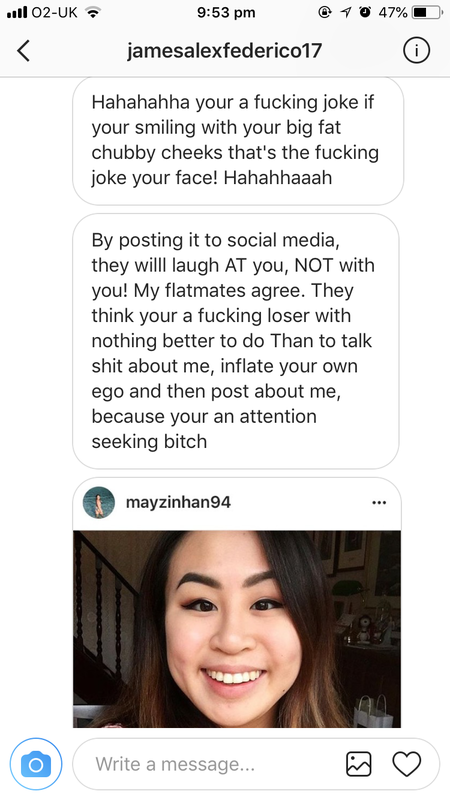 Long story short, but a guy I didn’t know kept sending me messages on Instagram. He sent me four in a row, asking me out and deleted two when I didn’t reply. Eventually, when it became evident that he wasn’t going to relent, I replied telling him I had a boyfriend. 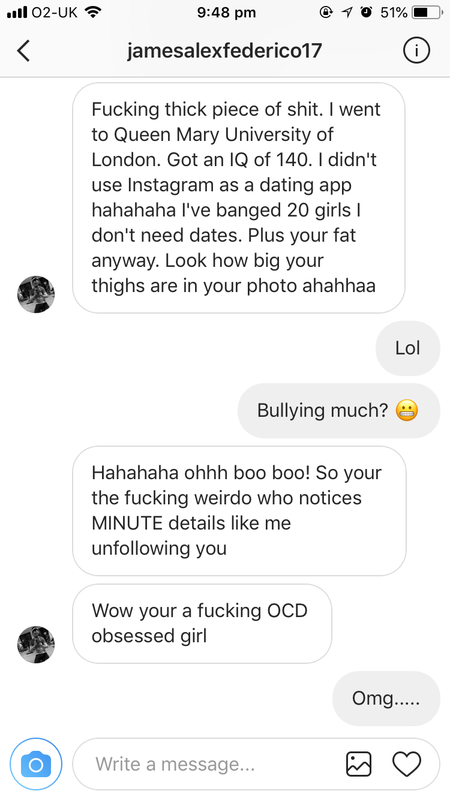 He then promptly began trying to follow and message one of my friends on Instagram. I couldn’t help myself and told him it was weird to do that - Instagram’s not a dating app. 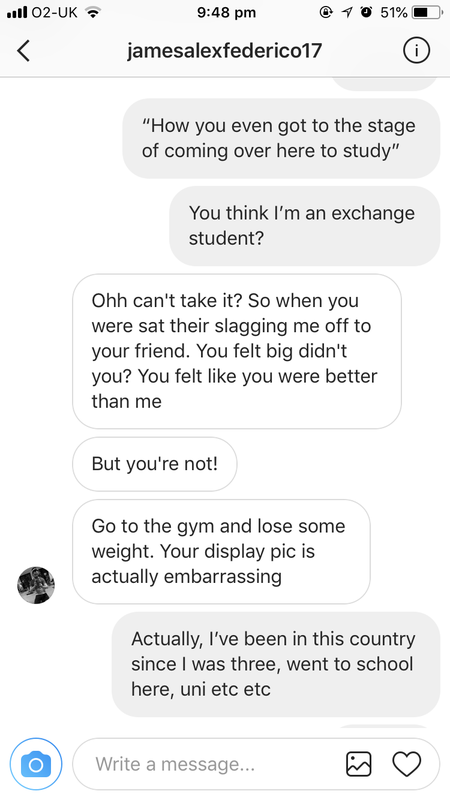 He flipped and began sending me a tirade of abusive messages, calling me fat and that I needed to go to the gym. 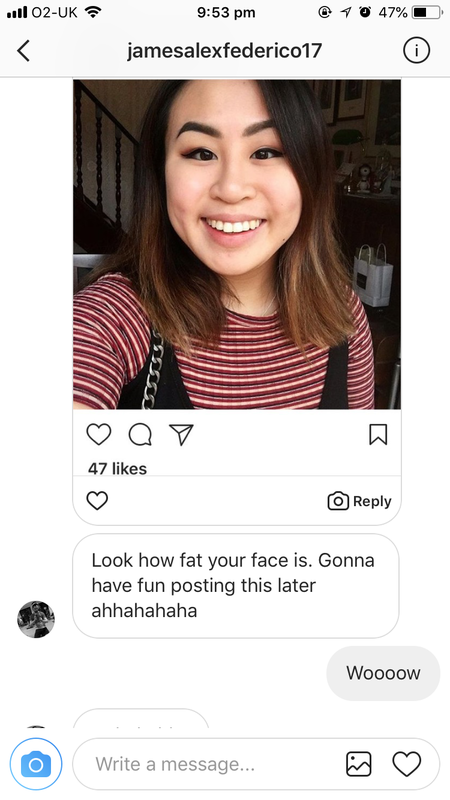 That my cheeks were chubby and it was hilarious when I smiled because it made me look fatter (he sent me a screenshot of one of my Insta posts, saying hahaha look at you). That I was stupid, his IQ was 140 and that he couldn’t believe I even got into the UK to study (my family actually emigrated to this country when I was three, so I was raised here and went to school, sixth form and uni here so it was a pretty huge, inaccurate and mildly insulting assumption to make). And it goes on. School ground insults tbh. Some people can't take rejection and I feel bad for them that they can't take 'no' as an answer. Bullying isn't always a choice, if he was rejected he better moved on with his life. he doesn't know what he's talking about. You look really pretty! Regardless, what he said about you is just not okay.